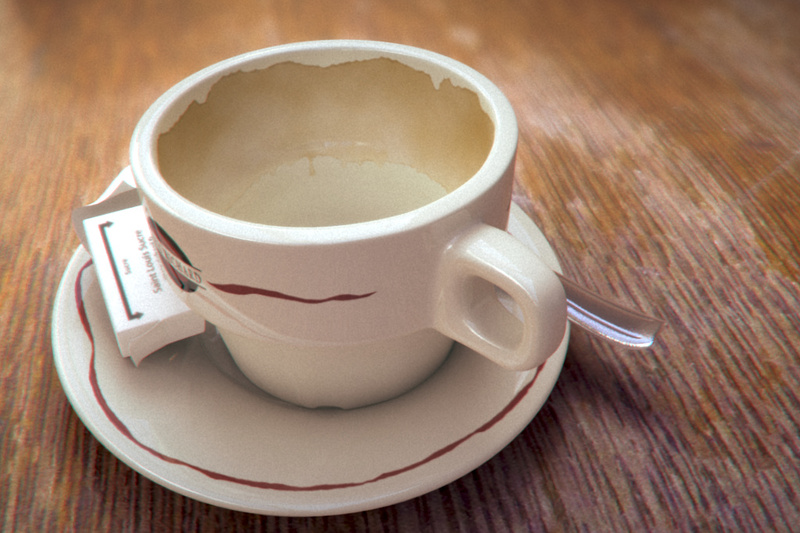 Here's a small update to the teacup image. I'm getting it to the point where I can use it for a lesson. It's coming along but I still have a small list of things to fix before I can do this with my class. I'm getting happy with it though. Needs 10% more magenta. Haha, just kidding. That looks great man! Honestly, I don't see any need for any fixes, that looks photo real to me. Now you just need a really emo comment on the side, like "You never said goodbye". By the way, for that head render your doing, check out shave and a haircut, its amaaaaaazing. So easy to get good results. The cup and saucer look great. I only have a couple small things to point out. The texture detail in the wood looks like it should be scaled smaller and there is no banding in the grain. The Shadow in the photo looks sharper as well.